At the beginning of November Lynn Corr (formerly Francoli) and I attended the Crest CC tandem weekend. Apart from the screams of fear when tandem triking the roundabouts of Harlow on a Friday Night and a jumping chain throughout the event, all went well. The event attracted about 30 crews. It’s really a pub crawl of entertaining proportions, with a following luggage van (driven by a gent who used to race against Johnny Walker) and mechanic. 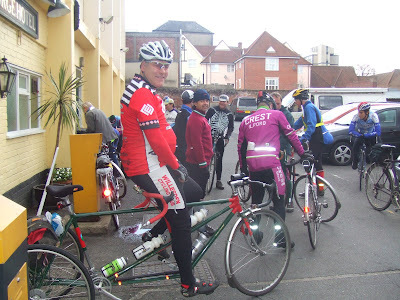 Friday saw us triking in last place up to the cycling club huts near Henham via a few hostelries – it wasn’t until 01:30am till our gear arrived from the lock-in at the pub. Saturday gave us a leisurely wind and rain assisted run to a pub in Edwardstone for lunch and a sing song before departing for the George in Colchester – a 14th century Inn with very comfortable rooms. After dinner it was off around Colchester with the organiser and an out of date “Good Beer” guide, looking for real ale. Most of the establishments we tried to find were now either estate agents or pizzerias. Finally we made it to the Hole-in-the-wall until closing time. Sunday’s return leg was to Great Saling for lunch and onward to the finish at Kelvedon Hatch to retrieve the luggage. The event is roughly 100km each way. 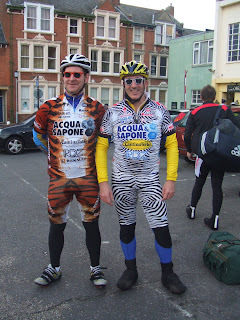 For us the round trip was 245km over the weekend. 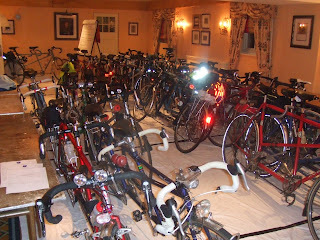 A good trip for lovers of weekend breaks with real ale, good company and a bit of cycling thrown in for good measure. One of the crews remembered sitting in behind myself and the late Jon Jennings on my Jack Taylor Longbarrow, as we battled in to the wind from Norwich back in the late 80’s. So it’s a small world. Willesden crews and solos will be most welcome on next years event. Finishing off with a little bit of ESB. What a pity that this wasn’t sent to Lindsey to include in the latest issue of the Link. Too late for meas Press Sec.